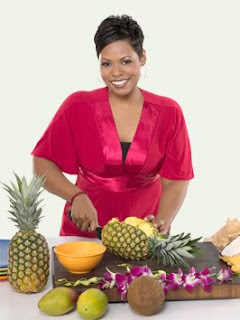 What do Jamika Pessoa, a contestant from The Next Food Network Star and I have in common? Besides our winning smiles :), we both heart mac and cheese. How do I know this? Lets just say I watched a lot of Colombo as a kid. Ok, ok, she and I were at Grub* on the very same day AND as if leading parallel lives, both ordered their “Famous Mac and Cheese” ($10.95). Though that's pretty much where the similarities end as far as I can tell. She is a real stunner, even prettier in person than on TV. I continued to gawk at her and gage her reaction whereas she was oblivious to my very existence. I wasn't able to pick up much of her conversation, though it wasn't for lack of trying. Craning my neck ever so subtly towards her table, I was able to deduce from the almost empty dish, she was either really hungry or thought the mac was worth devouring. As for me and my pregnant dining companion, Jessica, we had one major criticism; not enough salt. Anyone who knows me might find this statement shocking. I'm salt sensitive and have been known to send back a dish or two for this very reason. Fish is often the culprit in these situations. Chefs love to douse a filet in salt as if our finned friends find sea minerals comforting even in death. But when it comes to mac and cheese, there is usually enough salt in the cheese and butter to give the dish it's requisite savory quotient. In this case, I can only assume they used unsalted butter and mild cheeses. We tasted gruyere and cheddar in the mix as well as some spicy cayenne pepper. You can actually see the red flecks in the photo that gave this mac a bit of a karate chop in each bite. It gets top marks for its super creamy and cheesy consistency. The noodles were traditional, small, elbow macaroni cooked just right and there was a little parsley sprinkled atop, for color I presume. Now I think if you're gonna' go to the trouble of adding a decoration to mac and cheese, why not some toasted buttery breadcrumbs? Mac and Cheese makers of the world, not to be a broken record but, no cook ever got arrested for adding some crumbs on top. There, I said it again. In addition to the mac and cheese, I ordered the Mt. Olympus Salad, basically a Mediterranean salad hyperbolically described on their menu as "befitting royalty," priced at $12.25. What showed up was a rather unimpressive bed of mixed greens with a scoop of hummus on top, a few olives, shredded marinated artichoke hearts and some sun dried tomatoes. Perhaps it's because I'm not a monarch, but I found this salad almost inedible due to the loads of cayenne pepper in the hummus. It was so spicy it nearly wiped out the entire kingdom of my little plebeian taste buds. Overall, the food at Grub is indicative of the namesake. It's not fancy and in many cases, just fair to middling but it's a cute little place and I've heard the grilled cheese and tomato soup is worth the trip.